As is life, adventure travel is about making adjustments and wise decisions. Traveling with Tusker on its first trekking adventure to Chile and Argentina in 2017 requires the right stuff. Unlike most Tusker trips where porters carry most or all your gear, on the Torres del Paine leg of the nine day Chile itinerary, trekkers will follow tradition by carrying some of their own gear. They will split their belongings, giving a share to the porters and carrying some themselves. This requires precise packing. The right stuff at the right weight is essential. Tusker’s first ever Patagonia adventure embarks on March 6, 2017 with an exploration of Torres del Paine National Park in Southern Chile. The group will stay in some lodges and comfortable national park refugios in this wonderland of glacially carved pinnacles. This park has been the province of serious backpackers and mountain climbers for four decades and carefully limits travel in the sensitive backcountry. Porters will be limited because of these environmental considerations. Tusker trekkers will be asked to carry about half of their gear on the five days in the Torres del Paine backcountry when the group hikes between various covered refugios where they overnight. The refugios provide bedding, but among the things you should bring is a sleeping bag liner. The day pack you will use in the backcountry needs to be between 30 to 40 liters. Several companies including Kelty, Gregory, and Deuter all have day pack models that would work well in Torres del Paine. Bring a rain cover for your day pack as Torres del Paine’s weather is notoriously fickle. It can rain or snow one minute and be sunny the next, but wind is a constant. Garbage bags work as a cover but look tacky, so splurge and get a decent rainproof cover. Also carry a cover for your camera to keep it waterproof. Inside the pack should be the clothes you will need on the hike. Wet weather gear including rain paints, a wool sweater and an extra pair of hiking socks are a good idea. Gaiters and waterproof gloves are other good items to have should wet weather dominate. A windproof/waterproof shell might be the single most important article of clothing to have handy everyday on the hike. A wool beanie that fits under your rain hood is another thoughtful and warm accessory. Perhaps the single most important clothing item that you don’t need to pack is your hiking boots; just wear them. Make sure your hiking boots are fully waterproof, not just water resistant. There could be stream crossings and it will likely be rainy some days. And don’t forget your quality sunglasses. You’ll need them when the Patagonian sun is shining and reflects off the glaciers you will be climbing in Argentina. In your other bag that the porters will tote, consider stashing your non-hiking clothes as well as spare hiking socks and your toiletries with the exception of sunscreen; that should always be in your hiking day pack. On the Argentina five day extension you will be day hiking from your hotel base, so you don’t need to pack as precisely for each day. Patagonia is notoriously windy and capricious. Your gear should be tailored not for frigid altitude but for wet and windy weather that translates into colder conditions than the temperature indicates. Versatile clothing that can be layered is the best way to go. 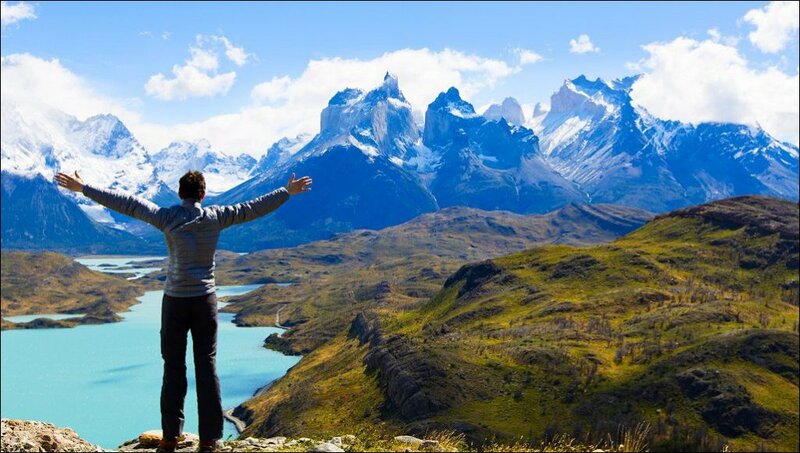 All this said, no need to worry about forgetting anything as Tusker provides you with a detailed packing list designed specifically for trekking in Patagonia when you join this epic adventure.